In June of 1752, Benjamin Franklin excitedly gathered his materials to fly a kite. With a silk scarf, hemp string, a key, and Leyden jar he and his son William hurried outside. Why? A storm was brewing, and Franklin knew this was a perfect time to prove his theory. After successfully constructing a kite and getting it to fly, the two men stood inside a shed. A storm was coming. At the top of the kite, he had placed a metal rod. From there a hemp cord traveled down to a metal key and silk scarf. At this point, many people believe that lightning struck the kite. However, that is not the case. What happened? Franklin placed his finger near the key. He felt a spark. The negative charges in the key responded to the positive charges in his hand. He had proven his theory that electrical charges were present around him. This experiment and other similar in nature led to greater research into atmospheric electricity. Electricity extends throughout our atmosphere. Scientists want to know how, where, and what makes these electrical charges occur. In addition, they want to build a global electric circuit model to help answer these questions. From what they understand now our Sun has the most significant impact on the circuit. In terms of Earth’s Global Electric Circuit, the Sun is central to its existence. It provides most of the ionizing radiation that produces ions. Ions, charged atoms, exist within Earth’s atmosphere, especially in its upper layers and regions. These regions are known as Ionosphere. We live in the Troposphere, the lowest layer of Earth’s atmosphere. It extends upward to about 10 km (6.2 miles or about 33,000 feet) above sea level. The next layer called the Stratosphere holds the jet stream and the ozone layer. In the Mesosphere, located above the Stratosphere, we find electrical currents, lightning events, called sprites and elves. They deliver large amounts of electric current to the upper atmosphere. Reports of these electrical currents were not taken seriously until the 1990s when technology allowed scientists to record these events. About 100 lightning bolts strike the Earth’s surface every second. Lightning is a discharge of electricity. A single stroke of lightning can heat the air around it to 30,000°C (54,000°F). This extreme heating causes the air to expand explosively fast. In fact, the expansion creates a shock wave that turns into a booming sound wave known as thunder. Scientists know how these events occur, but they still want a model to help them learn more. The Sun, the Earth, Earth’s magnetosphere, and the atmosphere’s layers all have electrical occurrences. Furthermore, the ionosphere, clouds, particles, lightning-filled thunderstorms, and sprites all contribute to Earth’s Global Electric Circuit. 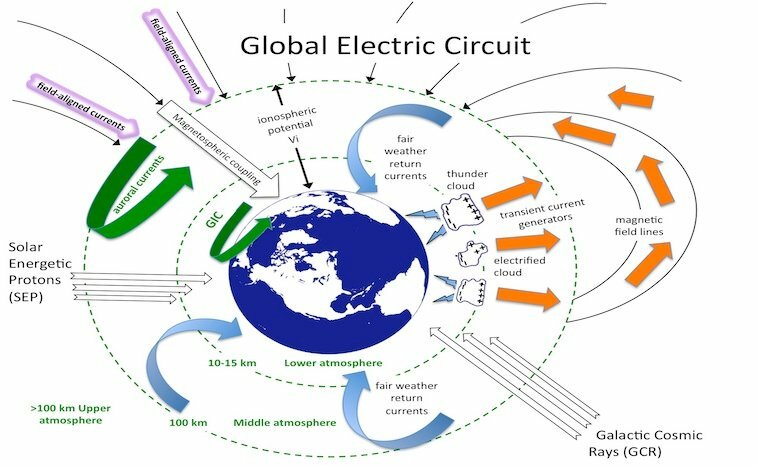 What impact does the Earth’s Global Electric Circuit have on climate and weather? A model will allow scientists to test their ideas. In the coming years, we hope that technology will allow this model to become a reality. For now, we will enjoy the awesome display of nature at work.